I finished reading this book May 23rd 2012 to be precise. I liked it. As I said earlier in My Authors and their books I hold Aminatta Forna (British; Sierra Leonean and Scottish heritage). 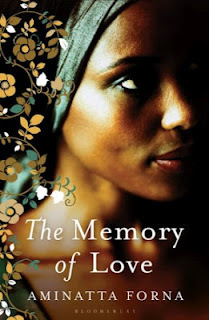 The Memory of Love 2010 awarded the Commonwealth Prize for Best Book in 2011, shortlisted for the Orange Prize for Fiction in the same year. Shortlisted for the International IMPAC Dublin Literary Award, with the winner to be announced in June 2012. This book deserves all the awards, Aminatta Forna has got an innate talent to put words together and to tell stories, what a matured mind. She is naturally good. I admire her. There is nothing ordinary in this work. However, I did not enjoy the novel, I find it difficult to go through, I had to go through 150 pages before I could start to understand. Aminatta's writings sometimes I found tedious. This is not an easy read, and it is a 500+ pages, this is a book for the matured in mind, not every body could sink into this novel. The story line is really very beautiful, this is the second book about Sierra Leon I've read so far. It tells (mostly) the story of a group of people (University teachers, doctor...) how they lived and loved before the war in an independent (corrupt) Sierra Leon, How the war changed them and the consequences of the change after the war. The story line is fantastic. The way it was written I consider too sophisticated. I recommend this book to the matured in mind. Please click here to read review in Spanish.